The Pioneer DDJ-RR Rekordbox DJ Controller is a compact and lightweight controller that?s packed with many features and dedicated controls for the Rekordbox DJ. 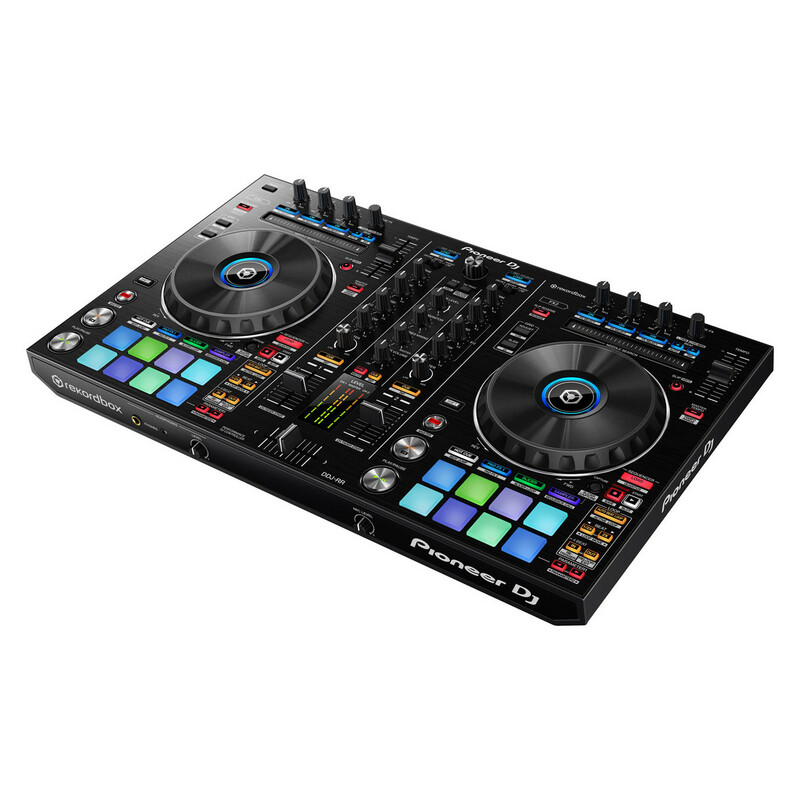 Based on the DDJ-RZ and DDJ-RX, the DDJ-RR features large jog wheels with illuminated on-jog indicators and tactile performance pads. Create your samples and set lists in Rekordbox DJ and then play them through the DDJ-RR with the dedicated controls and sequencer call button, making the DDJ-RR controller perfect for any DJ. 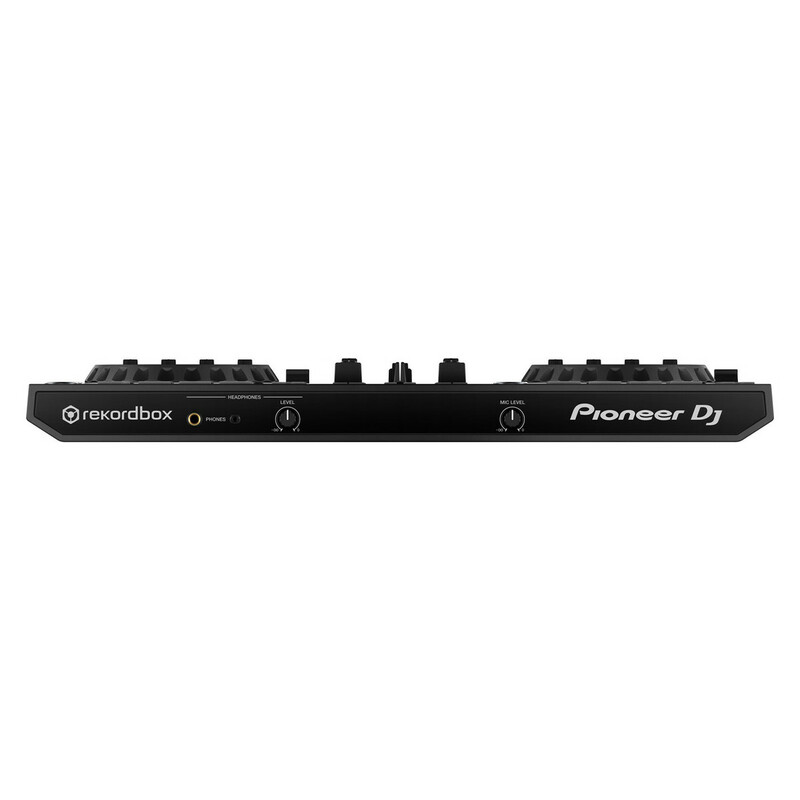 The DDJ-RR Control offers 2 channels and features the same circuit for master and booth outputs as their pro-standard DDJ-RZ controller. This design provides a faithful reproduction of the audio source for a clear, powerful sound. The controller also featuring touch strips to recreate needle scratches, or the ability to jump to any part of the track with just a touch. Dual level meters allow for both master out and channel levels to be viewed at the same time, providing excellent control over your sound levels. With a compact and lightweight design, the DJ controller can be taken on the road, and its grab handles providing easy transportation. The controller can be powered either by USB or AC power, providing an easy and quick set-up, perfect for playing in a wide variety of places. 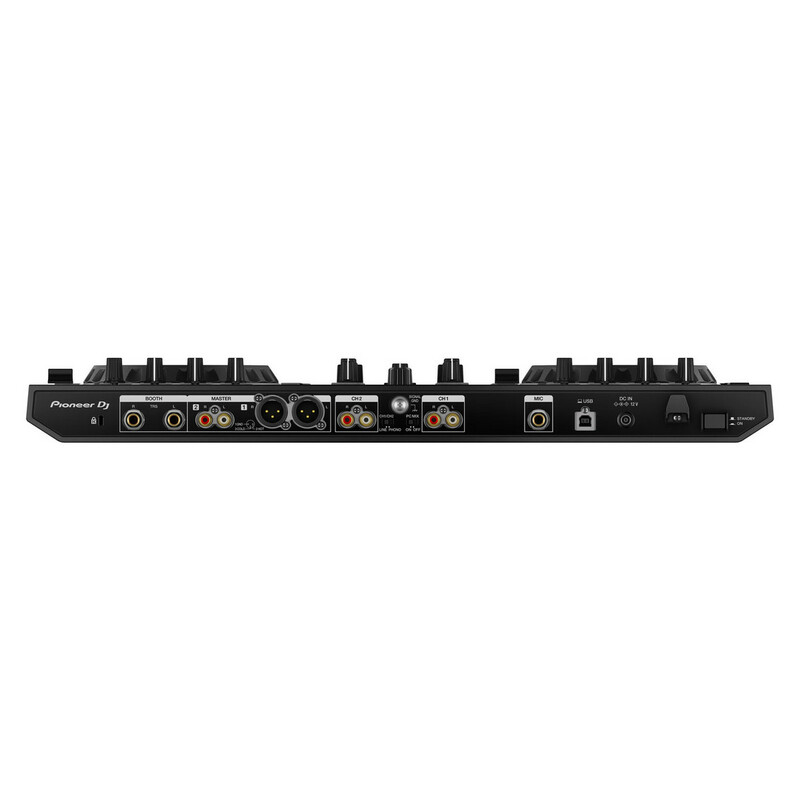 With balanced XLR outputs for connecting to professional PA systems, the DDJ-RR has booth and headphone outputs to give the ability to monitor your mixes. With phono and line inputs, the DDJ-RR can be used as a mixer, using it with multiplayers or turntables. 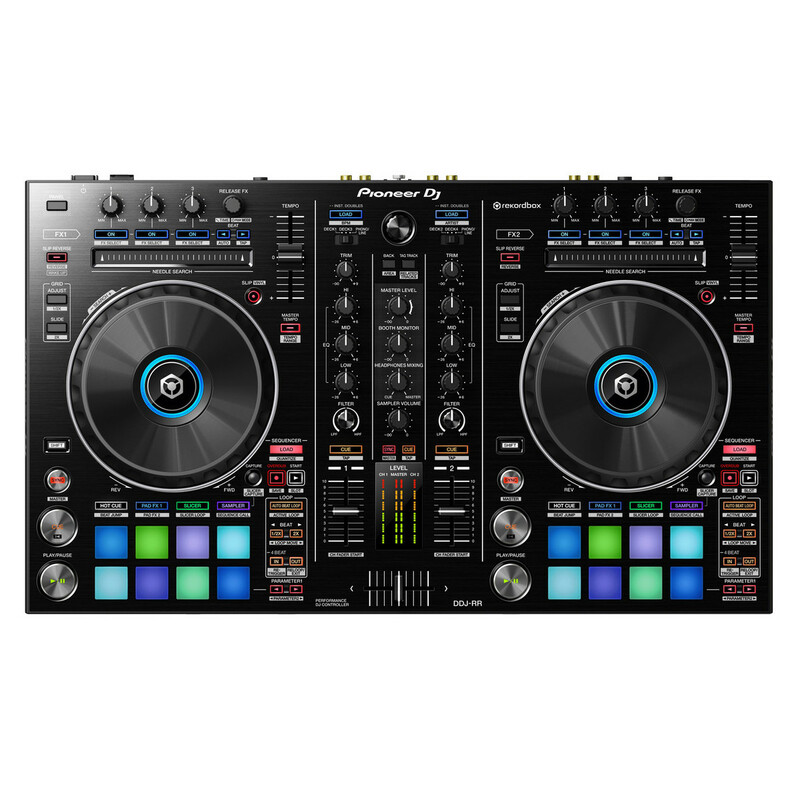 The DDJ-RR features 2 large jog wheels with illuminated on-jog indicators that can produce responsive scratching whilst the indicators provide statuses of each deck. The wheels also have durable brushed aluminium top plates similar to the ones featured on Pioneer’s flagship controllers and NXS2 set-up. Tactile performance plates offer controls for hot cues, pad FX, beat jump and slicer, and can have colours set for hot cues in the Rekordbox DJ. Sequencer controls allow the DDJ-RR to select and play sequences from Rekordbox DJ straight from your computer, whilst the dedicated controls provide more control over the Rekordbox DJ. Featured with the DDJ-RR is the Rekordbox DJ performance software that can be used to manage your library and to prepare your tracks and performance sets. Highly responsive, with low memory usage, the Rekordbox delivers stable performance, and its GUI mirrors the layout of the controllers to provide an instinctive and effortless control of all features.